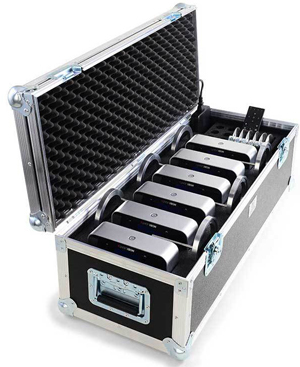 6 pieces of Mobilight 4 can be stored, transported and charged in the 6´ flightcase. The case is “Made in Germany” and very tough. Integrated are a power supply and 6 connectors to charge the Mobilight units. Accessories like remote controls and lenses can also be stored in the case.